Aaron Nola could be crowned the Philadelphia Phillies MVP for the first half with his latest performance on Sunday — a succinct bundle of emphatic personality and competitiveness. In a show of insistent work and power, Nola became the first National League pitcher to 12 wins on the same evening the Phillies obtained their 50th win – he personally drove in Philadelphia’s three runs, struck out 10, and shut out the Mets for seven innings. The 3-1 victory was another case of unexpected heroics (Nola’s hitting) sending the Phillies to victory. The lack of stability and consistency from night to night has haunted Philadelphia all season long. But Nola is an exception to all that, and if the Phillies are going to make a second half playoff push, he’d be the personality that leads to wins. Stability and consistency in tactic is a lesson the entire Philadelphia organization was striving for, by projection, in 2019. The surprise of Nola and the pitching staff in 2018 has been the factor that’s made the Phillies competitive, and the reason the team’s streaky batting is aptly frustrating. Nola has reached 12 wins while allowing three or fewer runs in all but two games, and failing to reach five innings only once. Even more impressive is how Nola has adapted throughout the season; he did not hit the 10-strikeout mark until game eight on May 8. Even in games where the lucky bounce of the ball went against him for a high BABIP allowance (.444 BABIP against the Mets on May 13), he handled the adverse luck well, minimizing nine hits with 100 percent left-on-base and 61 percent groundballs. Nola understands how to adapt to in-game scenarios and learn from mistakes, ensuring the Phillies have a chance to win. Nola’s history reveals a pitcher who has effectively evolved since a good rookie debut in 2015 (4.04 FIP, 77.2 innings). The 2018 season has been a step up from being effective on an individual scale, to an all-star level of influencing the entire team. His analytics have changed little in percentage, save for quality of contact. His BABIP has dropped from .309 to .262,. 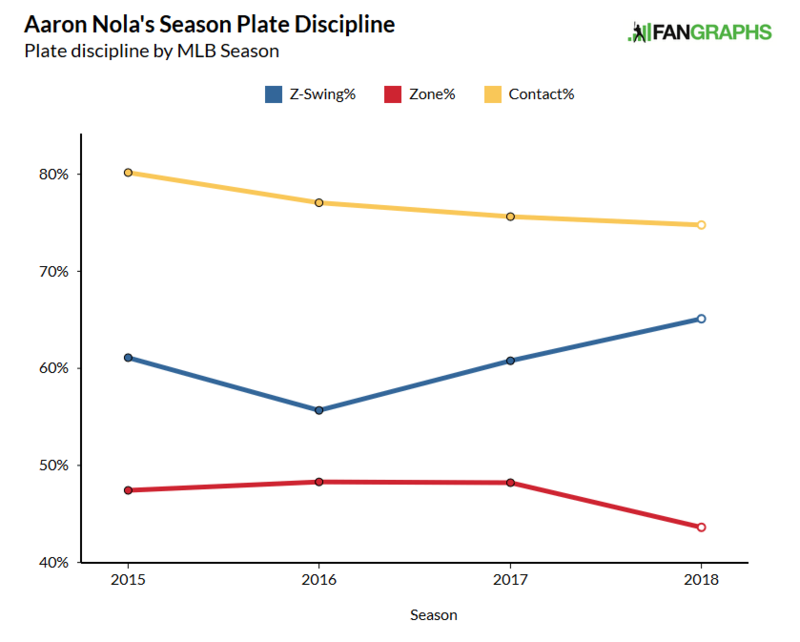 Comparing his 2017 and 2018 season for groundball and opposite-field hit percentage shows that the drop in contact quality has contributed to his improvement. Deception has also helped influence contact. Batters are swinging more in the zone (65.1 percent) despite an equal drop in pitches to the zone (43.6 percent). Since his rookie career, Nola has dropped contact percentage each season, now at 74.8 percent. Working away from zone reliance can help build a deceptive arsenal (or, “umpire independent pitching”). The pitch which he has developed each season on the way to becoming formidably deceptive is the changeup; the tick up to 20.3 percent utilization in an all-star season is no coincidence. A spin rate of 1406 RPMs is wizardry – it was only a matter of time before optimal placement would confound batters. The changeup is now landing in a more defined pattern, carefully in/out of the zone. 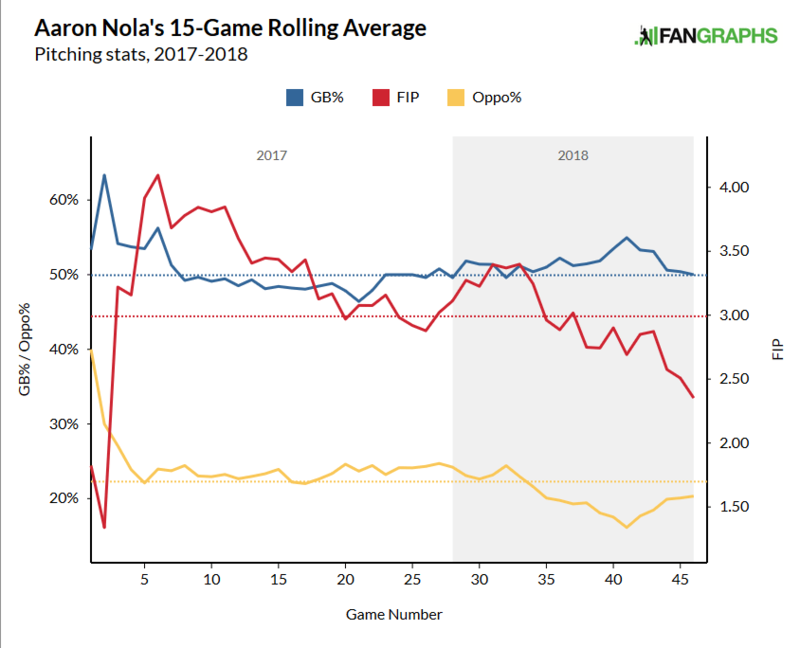 On a micro-scale, Nola is painting his changeup when behind in the count (comparatively more controlled) while also using more variance when ahead. Contextualizing Nola’s changeup is important; after all, this is a pitch which he uses only 20 percent of the time. The one pitch which made him an intriguing prospect was his curveball – a pitch which he has never finished a season with a wRC+ allowed above 46. His curveball is now complemented by his changeup, providing two effective breaking pitches, and thus variety and endurance. Against the Mets on June 9, for example, he did not throw a changeup until the second inning when he threw two at Kevin Plawecki, one for a swinging-strike, the next for a groundout. The off-speed pitch also led to a strikeout of Jose Reyes in the bottom of the third; he painted the corner of the zone with two changeups, and after the second was foul-tipped, a 91.6 MPH fastball delayed Reyes’ swing. In the fourth inning, two examples of Nola’s control stood out when he used the bottom-outside zone to induce a groundout from Wilmer Flores and Michael Conforto. Principled control to maintain a believable approach to the plate, only for the pitch to whimsically collapse before arriving at the plate. Flores would fall victim to this exact pattern again in the seventh inning. Nola has urgency, substance, and variance in his pitch arsenal but also the discipline to control and manipulate each of those principles. The prose of academia with the ferocity of athleticism – qualities which, for the hope of the Phillies, make this only the start to a long, all-star career.